Speculation abounds in Washington as to the content of the long-awaited Executive Actions that the Obama administration has promised to decree amidst the failure of Congress to enact comprehensive immigration reform. Having resisted pressure from Latino constituents and immigrant rights advocates to act before the mid-term election, in a vain effort to protect vulnerable Democratic incumbent Senators who lost their bids for re-election anyway, the administration now seems poised to announce new measures as early as the end of this week. Press accounts based on leaks from within the Executive Branch speculate that as many as five or six million undocumented migrants may see their vulnerability to deportation diminish as a result of the impending policy changes. Barack Obama’s Republican antagonists are fulminating about the consequences if he makes good on his promise, with some pondering ways to shut down the government or impeach the President, and others, fearful that a particularly intemperate response could damage the Republican brand, particularly given the need to attract at least a third of the Latino vote to the candidacy of whomever is chosen as the 2016 GOP presidential candidate, allude to the likelihood of court challenges to what they deem an extreme instance of Executive overreach. 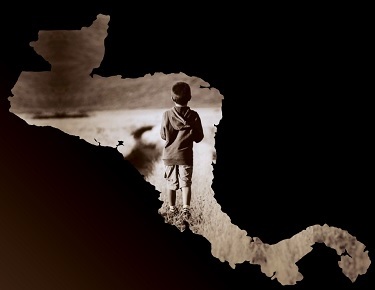 One unanticipated but welcome measure that has been announced publically is that children deemed vulnerable to the violence in the three Northern Triangle countries of Central America will be able to apply to be reunited with parents residing legally in the U.S. This policy shift, announced during the visit to Washington last week by Presidents Otto Pérez Molina, Salvador Sánchez Ceren and Juan Orlando Hernández, is among the administration’s responses to the surge of unaccompanied minors and families across the U.S.-Mexico border over the past year or so: 68,000 unaccompanied children were detained at the border during Fiscal Year 2014. For their part, together with Vice President Joseph Biden at the Inter-American Development Bank, on November 14 the three Central American Presidents pledged to launch an Alliance for Prosperity in the Northern Triangle, with the objective of overcoming the conditions of economic misery, social vulnerability and institutional deficiencies that propelled the wave of migration of recent years and that have the potential to motivate a renewed flow of arrivals. Biden offered an enthusiastic endorsement, but aside from reminding those in attendance that the administration had requested $3.7 billion from the Congress in response to last summer’s “crisis,” he did not offer specific commitments of resources, which of course are unlikely to be forthcoming from the strong Republican majorities in both chambers of Congress. Nor did the Presidents make tangible commitments to build states capable of protecting the basic rights to life chances and security that are so remarkably absent for many of their countries’ inhabitants. Assessing the likelihood of continued surges in migration requires understanding the factors that propelled the flow of people across the border in recent years. 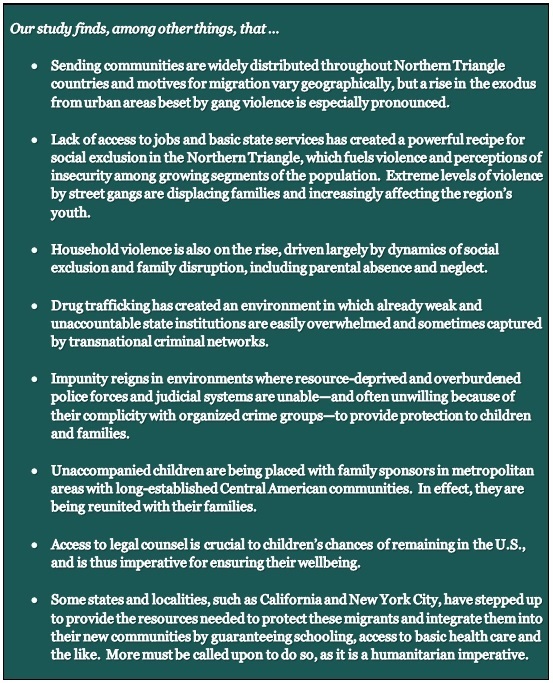 A newly released study* by the Center for Latin American and Latino Studies, funded by the Ford Foundation, provides essential data and analysis on the drivers of migration from El Salvador, Guatemala and Honduras and on the fate of children and families who have arrived in the U.S. from those countries over the past year. A core message of the report is that the absence of fundamental pre-conditions for living their lives with dignity – education, jobs, and most of all protection from violence – compels people to migrate rather than seek to better their lot in their communities of origin. In the long run, only dramatic reforms undertaken by Central American states will build the institutions needed to address the basic needs of their populations and to provide the minimal levels of security needed for them to live their lives in dignity at home. Perhaps little that was agreed upon during the Presidents’ visit to Washington gives cause for great optimism, but it is our hope that the CLALS study points the way toward solutions to the region’s crisis and toward ensuring the protection of those who endured the perilous journey to the U.S. border and now find themselves in limbo in the U.S.
*To download a free copy of the full report, click here.